Samson’s heading down the road with his parents and a young lion jumps out and attacks him. Samson easily rips the jaws of the lion open with his bare hands. Later he passes the lion carcass and notices a swarm of bees have made honey in the carcass so like Bear Grylls he scoops the honey out to feed him and his parents. Funnily enough, he doesn’t tell his mum and dad where he got the honey from. Samson’s riddle meant that he and his family got something sweet – honey 🍯 from that which was ready to devour him – the lion 🦁 with all its strength and fury. We have a picture here of life (bees and honey and the resulting pleasure and strength) coming out of death. It reminds me of the story of the bitter waters at Mara where Moses was to take some wood, threw it in the bitter water and the bitter water became sweet. Life and refreshing came out of bitterness once again. It’s a great picture of the Cross where the ultimate honey came out of the carcass. From the sacrificial death on a Cross, came sweetness of new life. 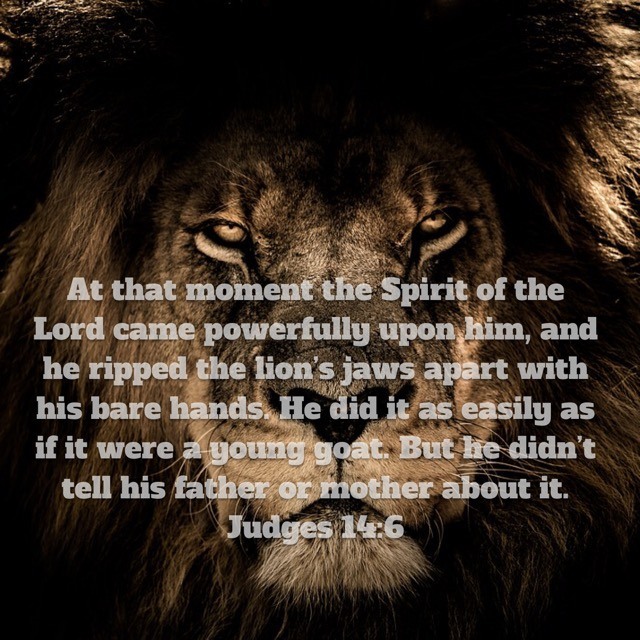 A lion came with its fury and strength to destroy Jesus as He hung on that cross but Jesus uttered that phrase “tetelestai” meaning “it is finished”. Victory over death was finished and now new life could spring forth. And so Samson’s riddle is a great picture (foreshadowing) of the greater victory to come through Jesus. And this gives us great hope for the devouring lion 🦁 experiences and bitter water experiences in our lives. “Something to eat” and “something sweet” can come from the carcass of that lion experience giving sustenance and pleasure not only for us but our families too. Why? Because “it is finished”! Because of Jesus’ death on the cross devouring lions and death no longer have the final say. Why not? Well Samson was able to kill the lion and rip its jaws open with his bare hands because “the Spirit of the Lord came powerfully upon him”. And guess what? The way to destroying the lions 🦁 of trouble that come against you is through destroying them with your bear hands with the same power and Spirit that enabled Samson. That’s why Paul prayed you would have the eyes of your heart opened and understand the incredible greatness of Gods power for you. But it’s only available to those who believe. Faith in His power is the key to honey 🍯 from the carcass. “Later, when he returned to Timnah for the wedding, he turned off the path to look at the carcass of the lion. And he found that a swarm of bees had made some honey in the carcass. He scooped some of the honey into his hands and ate it along the way. He also gave some to his father and mother, and they ate it. But he didn’t tell them he had taken the honey from the carcass of the lion.